Disclaimer: This is an honest review and all opinions are my own. 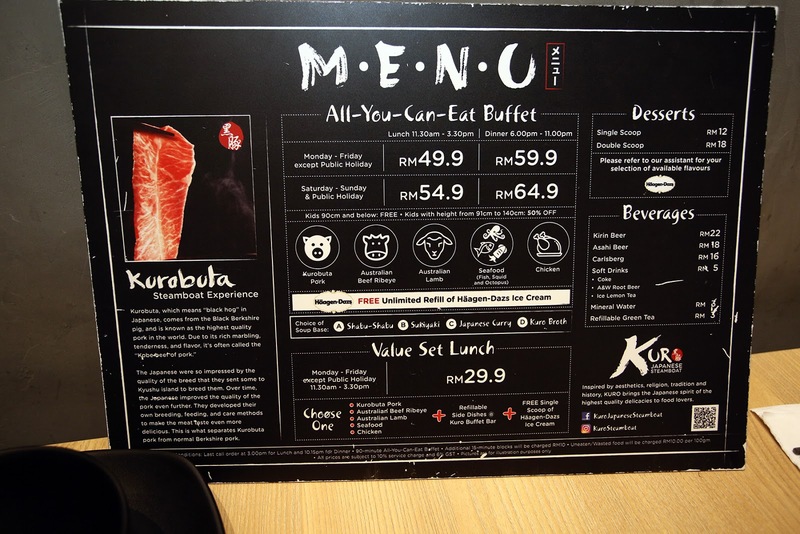 Nested in the new and uprising lifestyle hub filled with eateries, watering holes, and more eateries, Kuro Japanese Steamboat stands out with its brightly lit brushstroke-like signboard in Plaza Arkadia, Desa Parkcity. 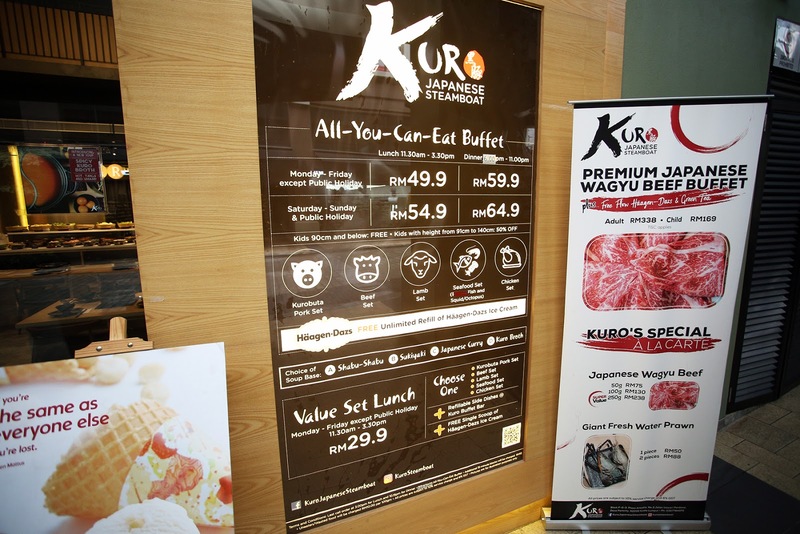 I've been hearing peers discuss and compare Kuro with other Japanese steamboat restaurants for a while now, but I was instantly drawn to visit this establishment when I heard of free flow Häagen-Dazs ice cream and the use of Kurobuta pork (Japanese black pork) at this buffet. 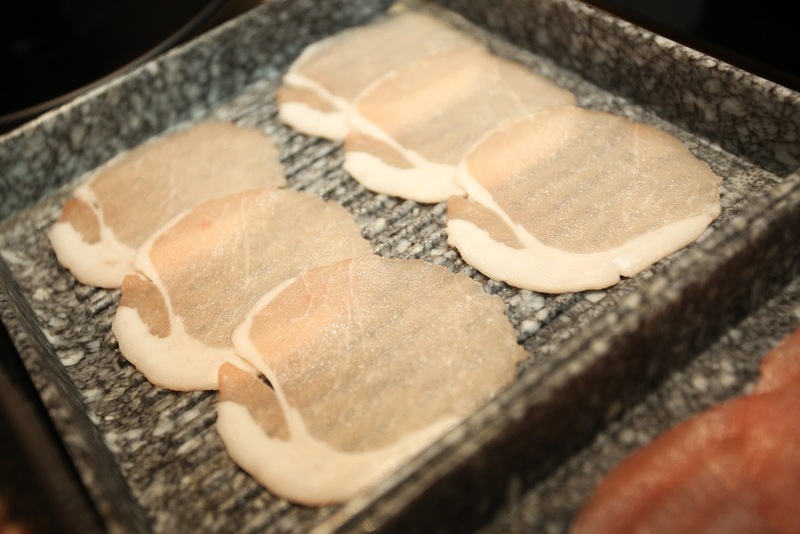 In case you needed a little more kicker to succumb, Kurobuta pork is also known as the highest grade of pork in the world. 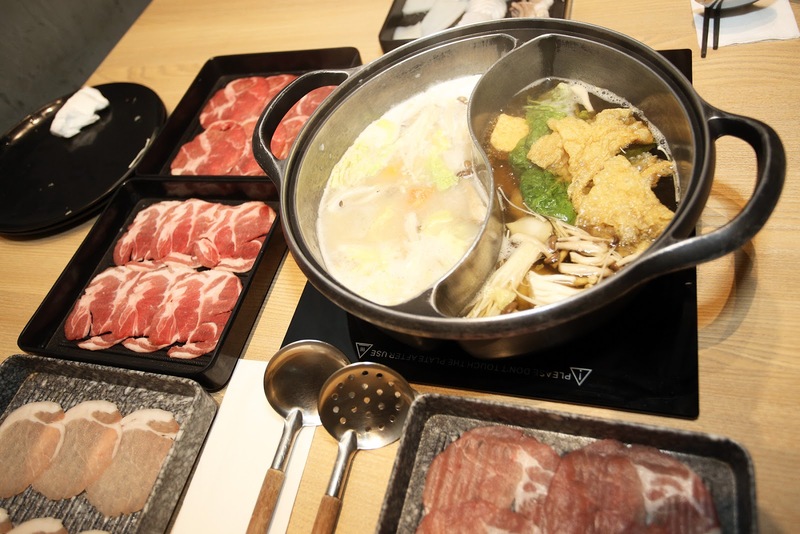 At Kuro Japanese Steamboat, patrons get 120-minutes of unlimited meat refills. 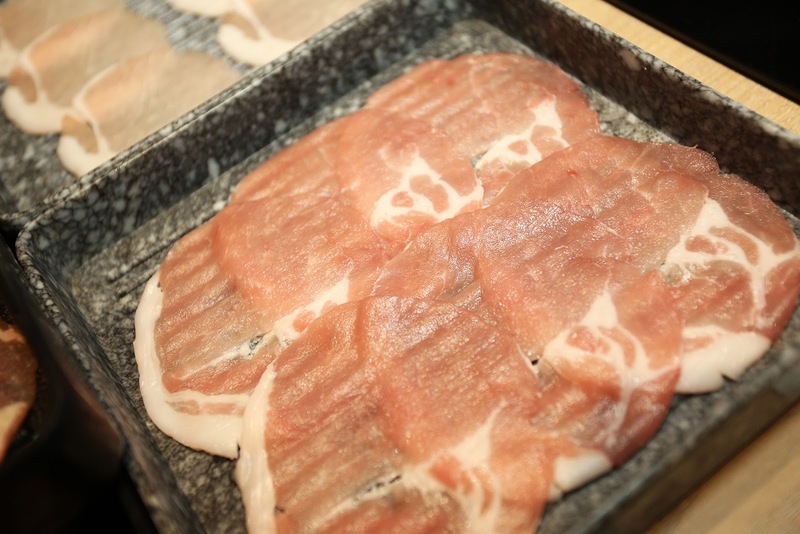 That's two whole hours of Kurobuta pork! Say no more. 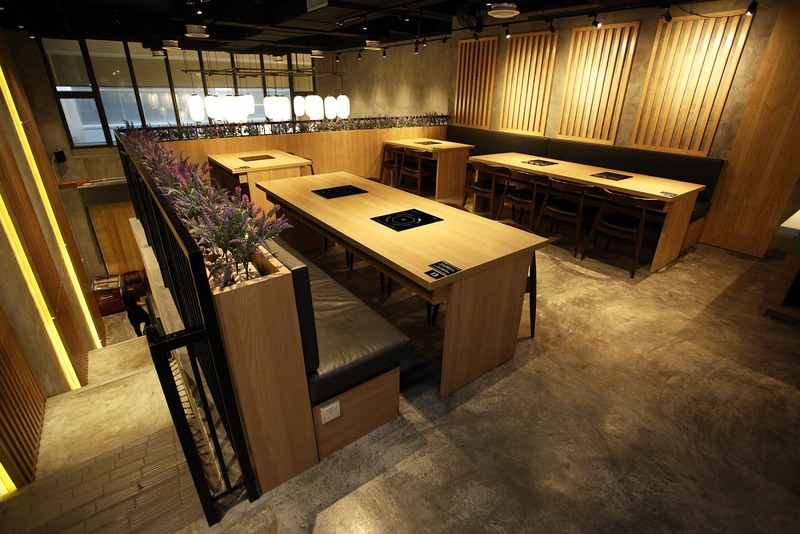 Stepping into a clean, organised-looking restaurant with ample walking space and having all tables with easy access to the side dishes, ice cream, and green tea also meant less time refilling and more time dining. If you're wondering how I got photos of the empty restaurant, I caught the service team off guard just moments before they opened doors. I was pleasantly surprised by the swift and friendly service I got despite the restaurant catering to a full-house crowd at dinner time on a Monday. 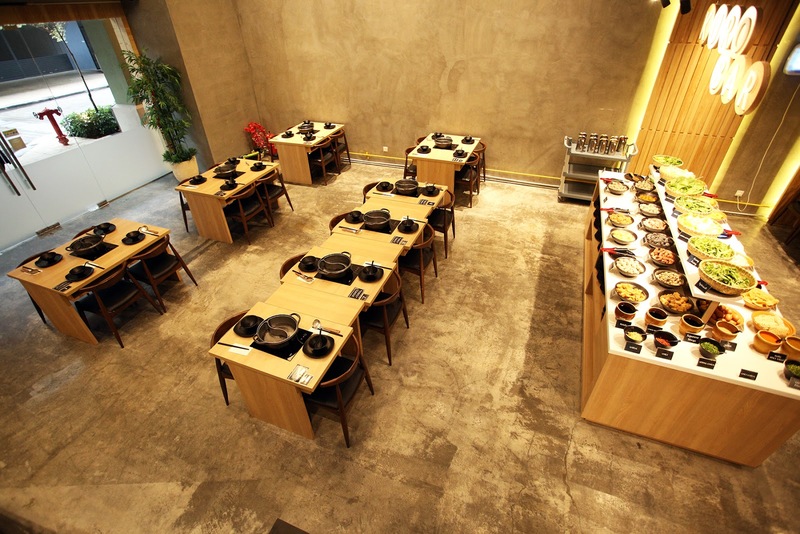 For diners who prefer different meats, the restaurant also offers a wide array of choices, from chicken, beef, lamb, to seafood. One of the attractions Kuro had me sold was their broth. 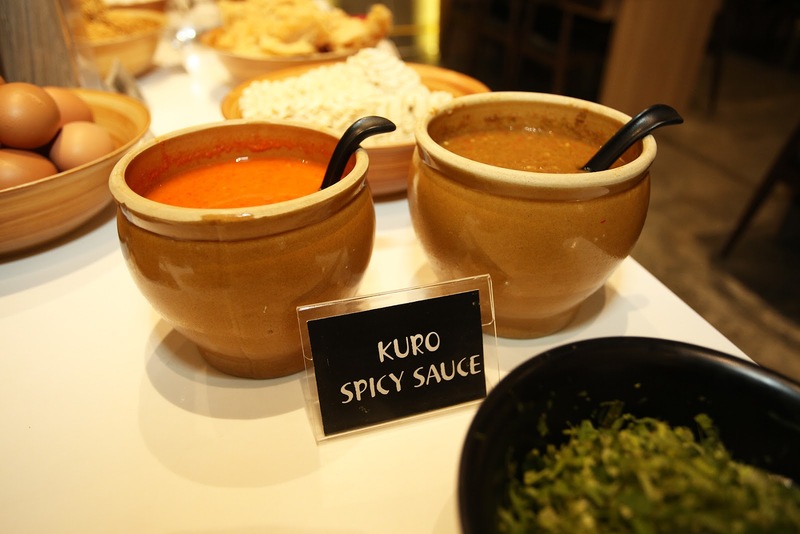 You get to pick two of five broth choices offered, namely Kuro Broth, Japanese Curry, Shabu-Shabu, Sukiyaki, and their latest addition, the Spicy Kuro Broth. Named after their restaurant, the Kuro Broth is boiled over a long period using pork bones to achieve a sweet and rich taste. 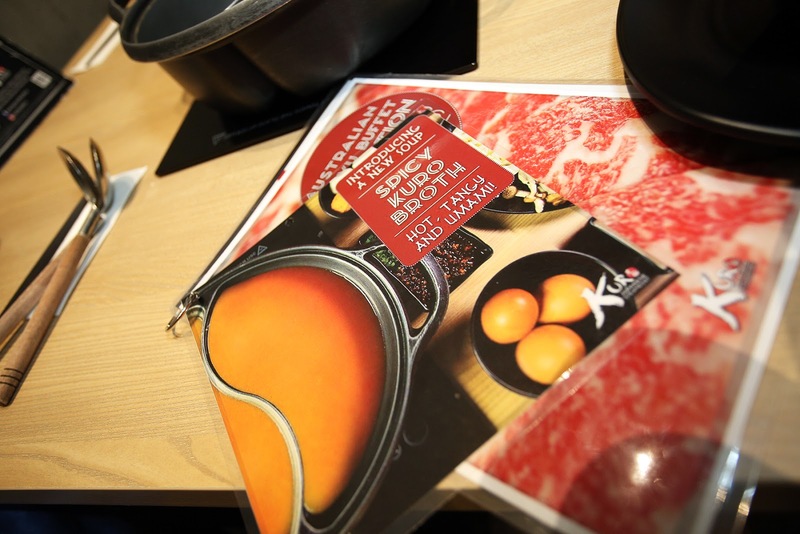 I would have loved to try the Spicy Kuro Broth, but instead went for a safer choice of the Kuro Broth and Shabu-Shabu base this time as I was travelling the following day. However, this only means more of a reason for me to return soon to taste their spicy in-house broth. While the Shabu-Shabu base was average, it got noticeably (and pleasantly) sweeter over time as I loaded it with greens and meats. The Kuro Broth on the other hand was by far one of the tastiest steamboat soup base I've ever had, to the extent I enjoyed drinking it on its own and even asked for several refills. The broth which boasts an "umami" or savory taste did not disappoint. 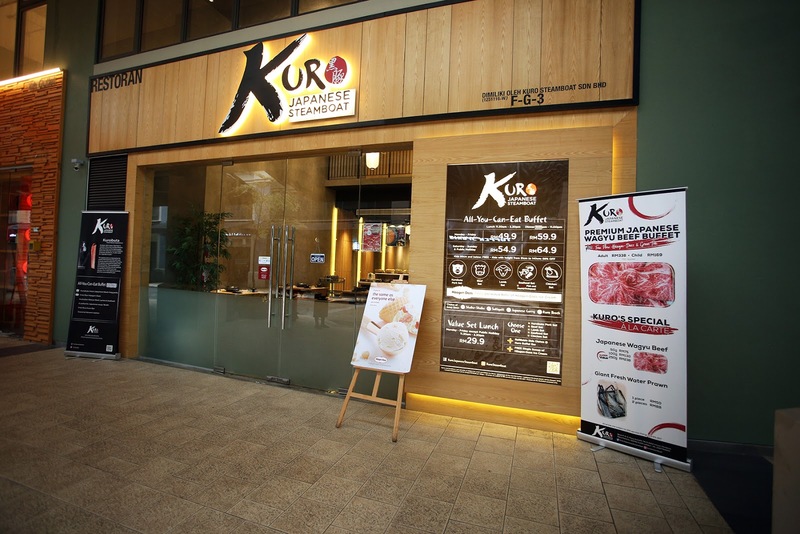 I learned that beyond the Kurobuta pork cuts offered here, Kuro also uses premium grade beef and lamb imported from Australia, and that their meats are sliced-to-order to ensure the highest level of freshness. Additionally, the seafood set I had was clean and well prepared (unlike many steamboat places), and sure enough tasted fresh. 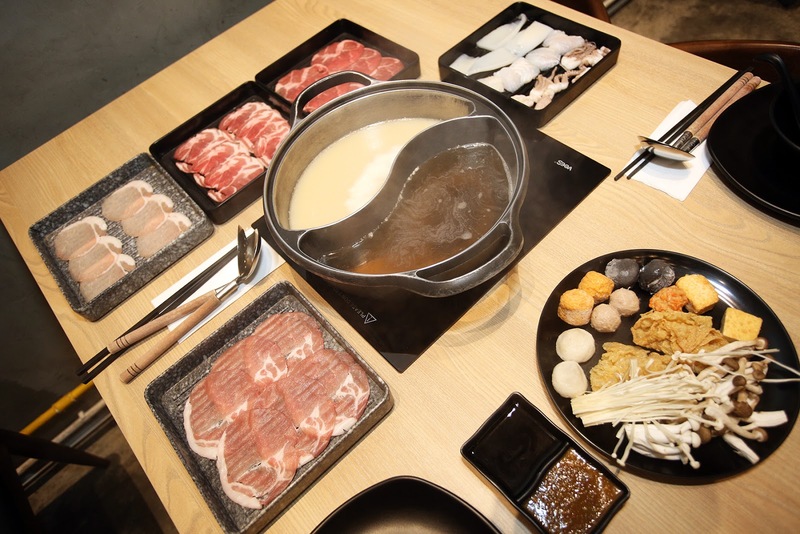 It goes without saying that side dishes and greens are necessary to complete a steamboat experience. 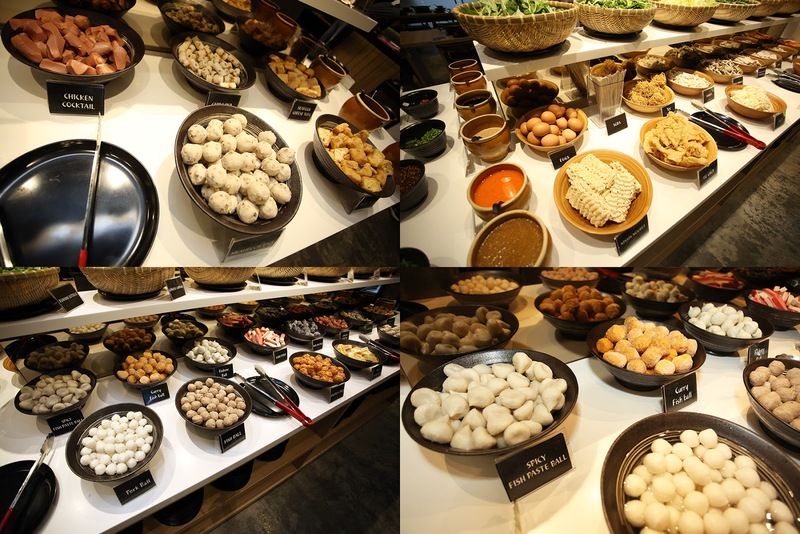 Kuro's wide spread of side dishes left me spoilt for choices as they had the usual steamboat items, but also had unique items placed on their "Kuro Bar", like the Kuro Ika Ball (squid ink ball), spicy fish paste (otak-otak) ball, curry fish ball, Japanese sweet potato, and more. Kuro's mouth-watering in-house chilli sauces are also a must try, with a balanced tangy taste that doesn't overpower your palate. 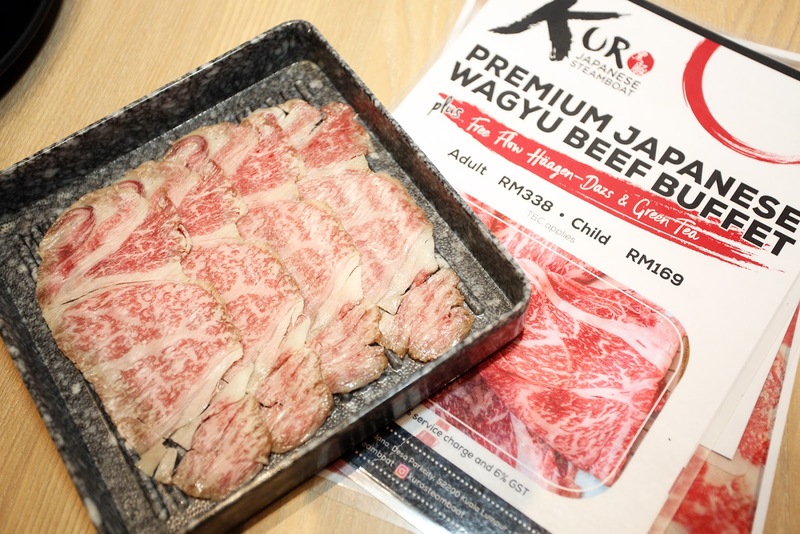 Thanks to the good folks of Kuro, I was also treated to some fine cuts of Australian and Japanese wagyu beef, which Kuro has promotions going on for these quality meats at a reasonable price. 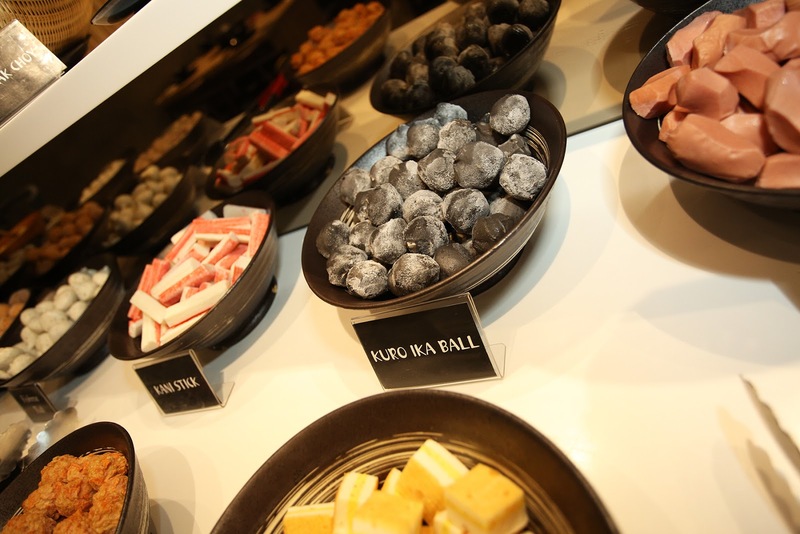 They even have a buffet solely for all the premium Australian and Japanese wagyu beef you can eat within 120-minutes at only RM98.90++ and RM338 respectively! 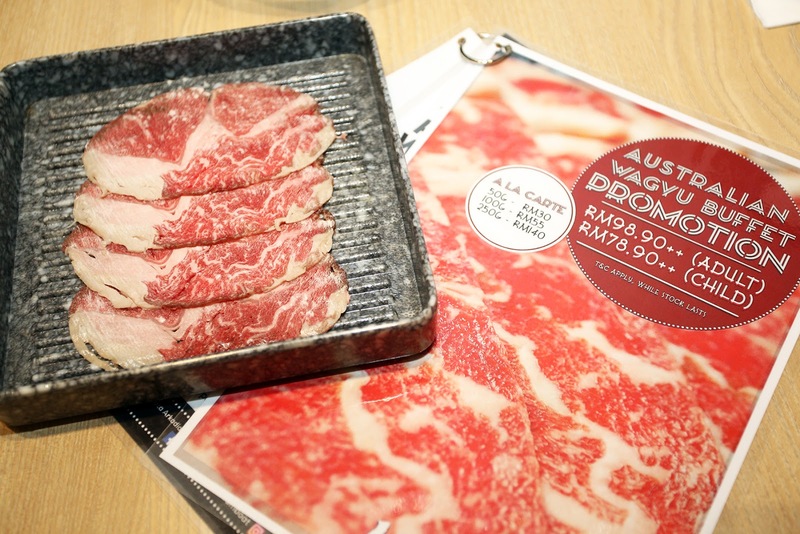 Like their regular buffet meats, these fine wagyu beef are also sliced and prepared only when ordered. 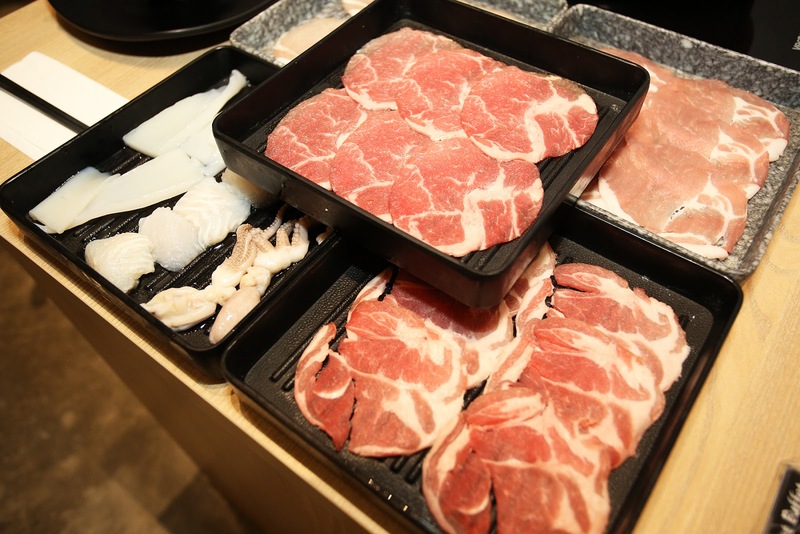 Honestly, I think another key element that distinguishes Kuro from other Japanese steamboat joints is their emphasis for fresh, quality cuts. 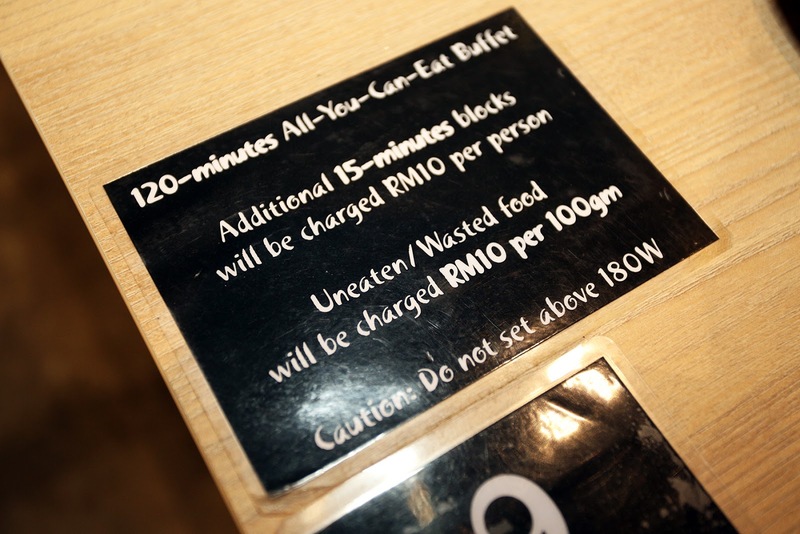 Like any other buffet joints, food wastage is frowned upon and I think it's only right to penalise patrons who decide to waste precious food - a penalty is imposed by Kuro based on the amount of food wastage. After a hearty meal, I finally got to the moment I was most excited for - Häagen-Dazs ice cream! The manager kindly offered to scoop me ice cream, probably because he saw me mid-food coma. 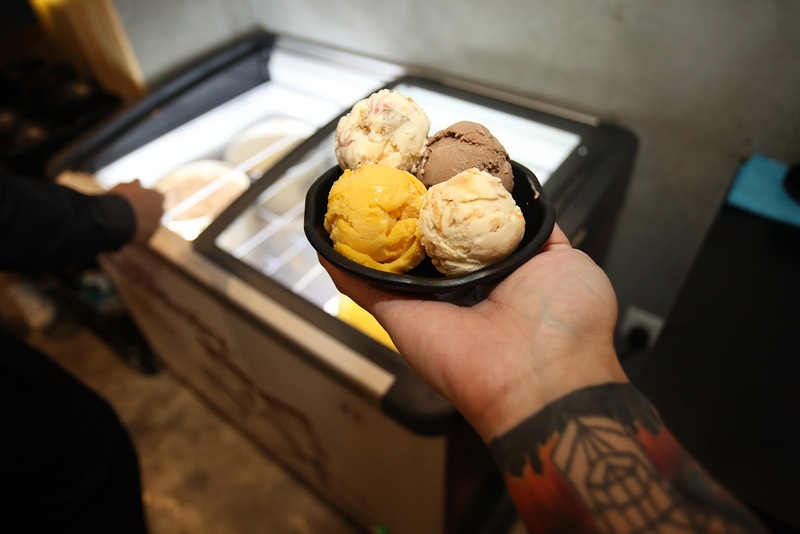 There were four flavours of the day so I got one of each - Strawberry Cheesecake, Chocolate, Salted Caramel, and Mango Sorbet. 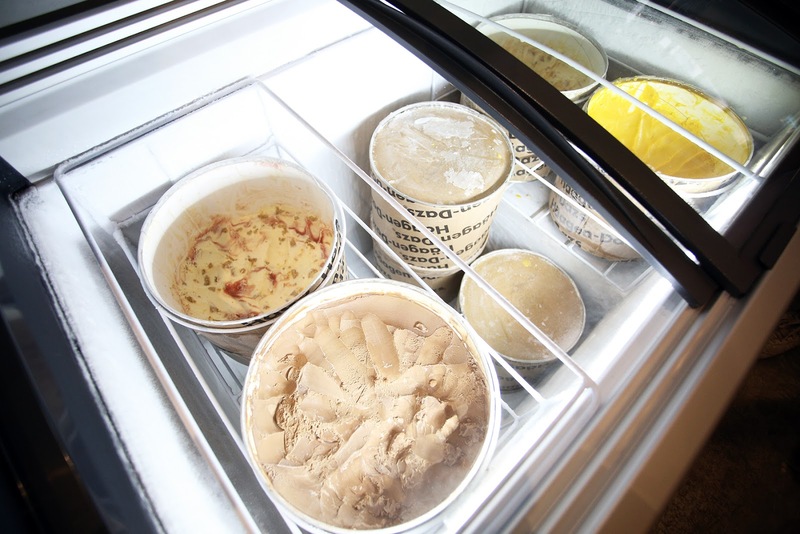 I was amazed that Kuro actually maintains their Häagen-Dazs choices and rotates flavours as each drum finishes. 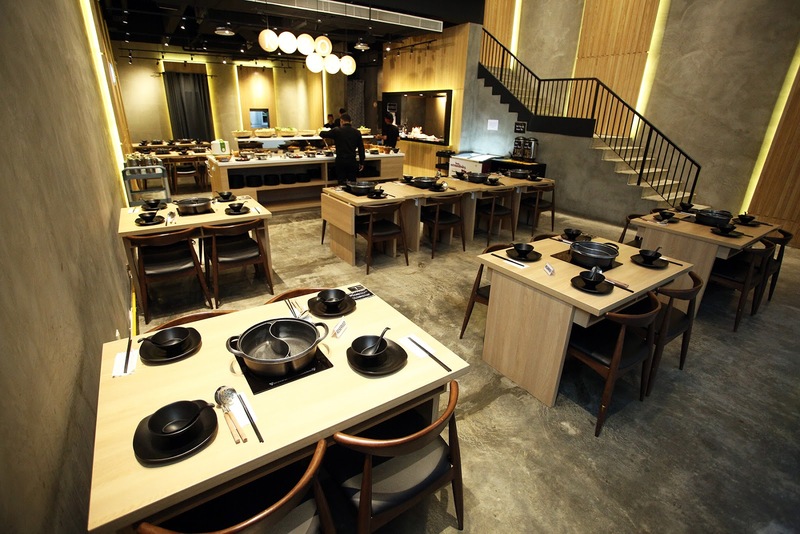 Despite a debateable "drawback" about Kuro Japanese Steamboat being priced slightly steeper than competitors, I found the price difference to be miniscule and it certainly was justified by the quality service, food, and overall experience. I was also told that patrons who wish to dine here on weekends are advised to make a booking to avoid dissapointment. My verdict: Definitely worth the price paid, especially knowing that the meat cuts are fresh and of premium grade. This could be a occasional treat to myself, especially knowing I could cleanse my palate with unlimited amounts of Häagen-Dazs after! 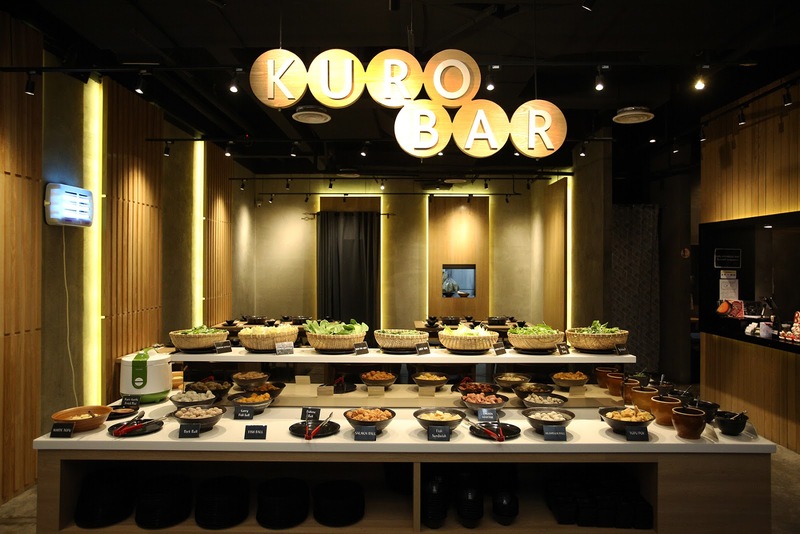 To make a booking or for more information, you may contact Kuro at 03-2778 4370, or visit their Facebook page here. 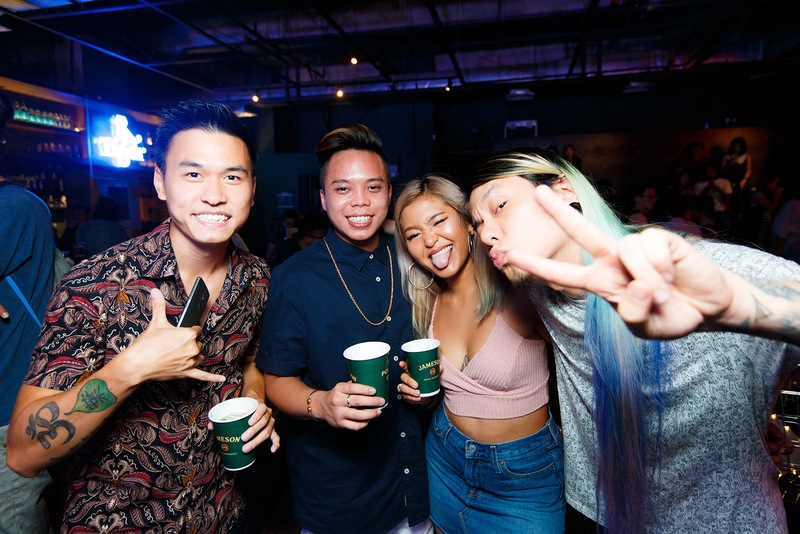 11.30 a.m. to 3.30 p.m.
An Honest Mistake Records and Jameson Irish Whiskey Malaysia joined forces yet again for a fun-filled evening celebrating women empowerment with AHM Records X Jameson Irish Whiskey: Girl Power. With women empowerment as the theme of the evening, official venue sponsor The Bee, Publika witnessed a full house where attendees were treated to a vibrant music scene with amazing musical lineups from female artistes and women-fronted bands Nadhira, Fazz, Kita: Orang, and Beverly Matujal, as well as bedroom musicians showcasing their talents during the open-mic sessions. 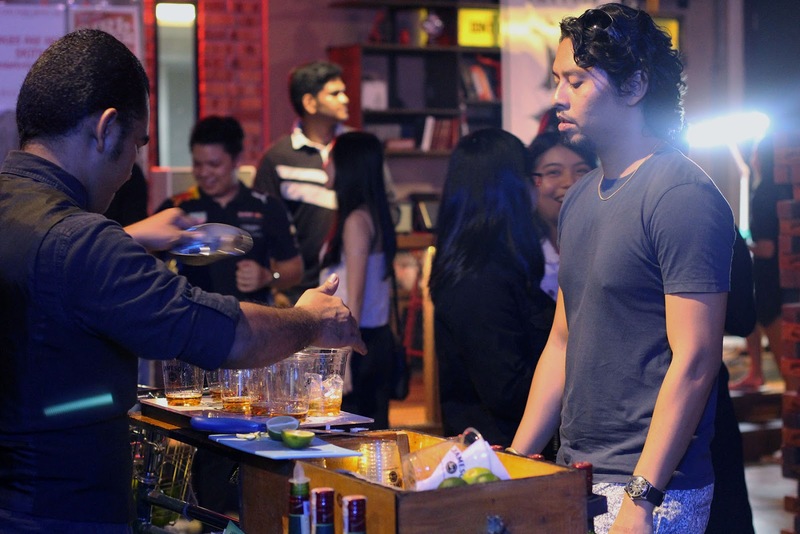 Beyond musical performances, attendees also ended their weekend (or kick-started their week!) 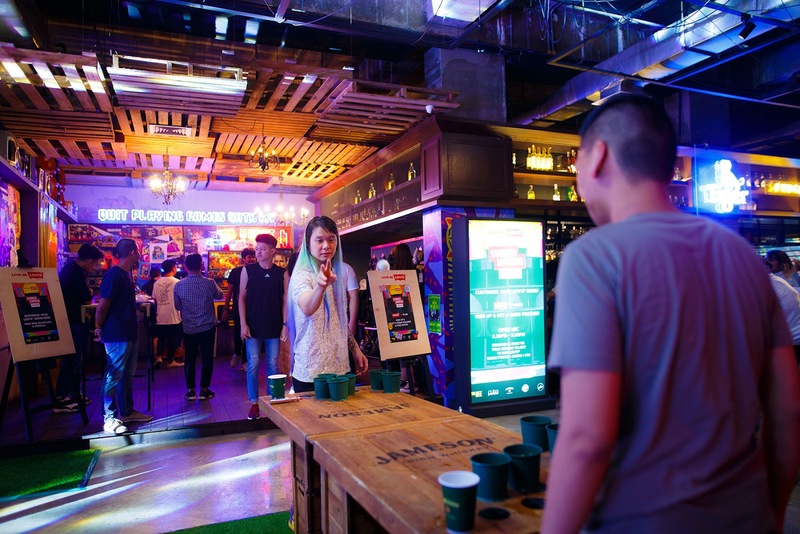 with an array of entertaining games like Whiskey Pong and Giant Jenga, where the winner of the Whiskey Pong tournament walked away with a limited edition bottle of Jameson Irish Whiskey. Talented artists from Shipwreck Tattoos also graced the party providing flash tattoo pieces, while Marshall Headphones showcased their audio products and provided a listening booth to keen audiophiles. 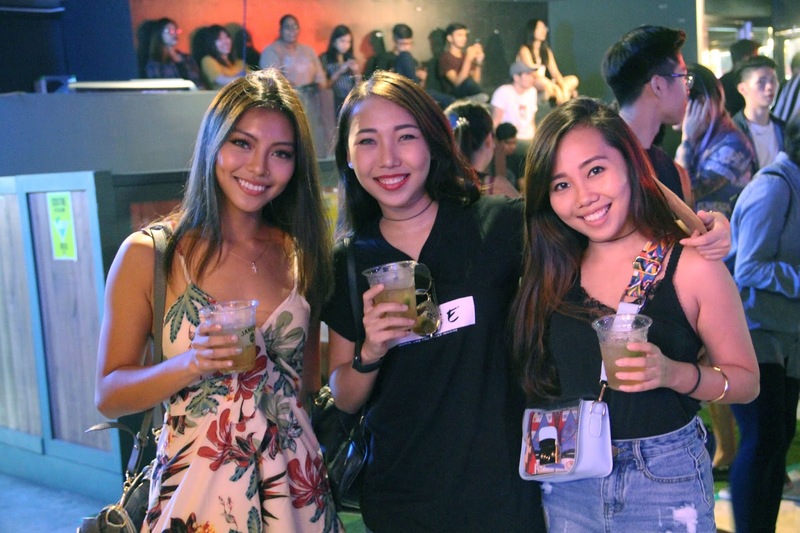 To complete what seemed like a perfect evening, attendees were also gifted goodie packs sponsored by beauty and fashion giants Kiehl’s and Forever21. 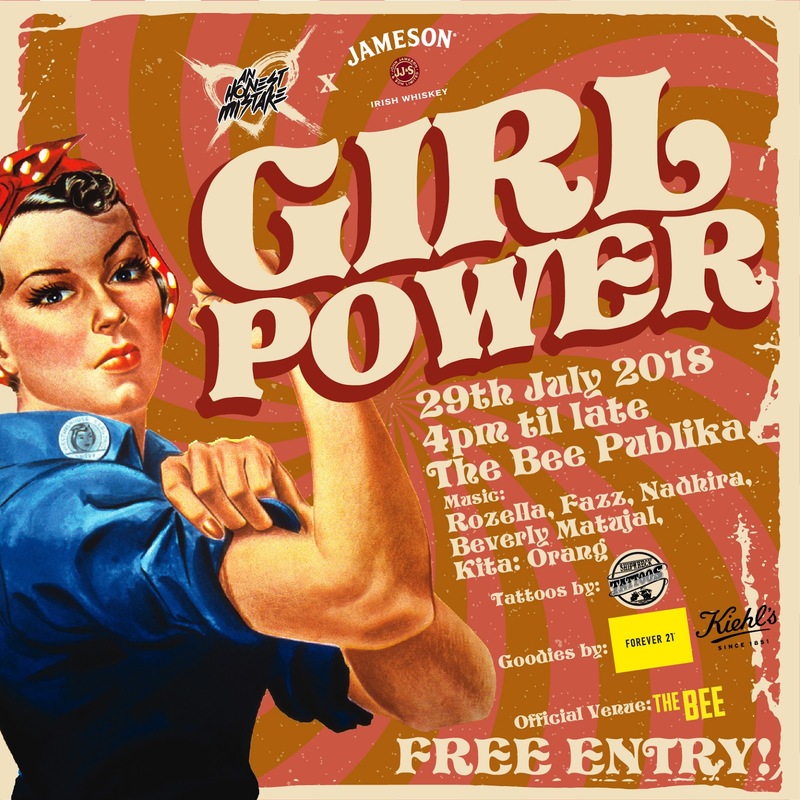 In conjunction with the Women Empowerment Year of 2018, An Honest Mistake Records and Jameson Irish Whiskey are once again proud to present their latest collaboration together, AHM x Jameson Irish Whiskey: Girl Power, which will be held at The Bee on 29th July 2018, from 4PM onwards. 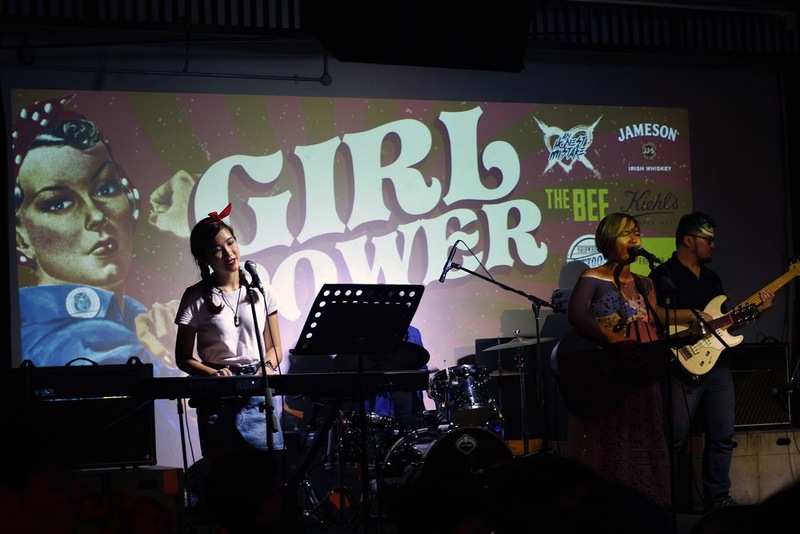 By recognising the need to celebrate Malaysian women, both An Honest Mistake and Jameson Irish Whiskey understand the need to highlight gender equality and provide a platform for many local female acts to perform. In a developing country like Malaysia, it is imperative to share this vision with others, thus making the women empowerment movement not just be a one-time event, but a daily practice. R&B artiste, Nadhira, indie electronic singer, Rozella, swing jazz band, Fazz, acoustic duo, Kita: Orang and pop singer songwriter, Beverley Matujal will be joining the team on the main stage during the event. 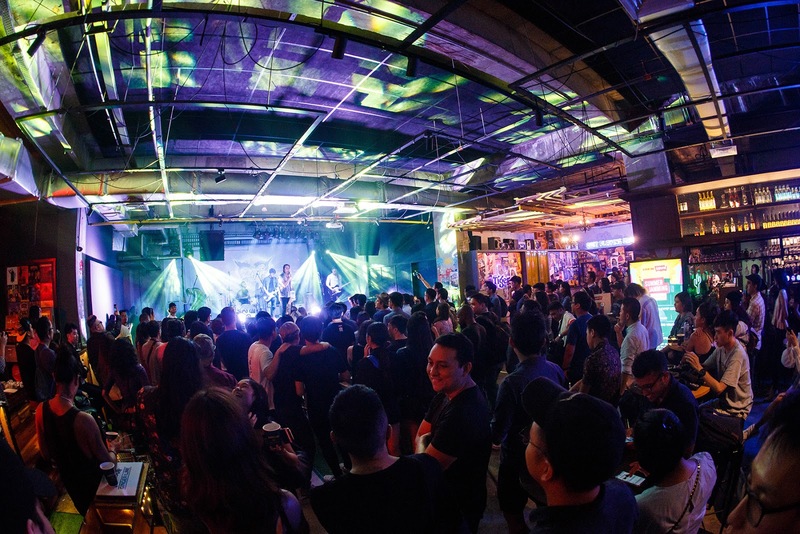 Besides that, there will also be an open mic session, serving as a platform for aspiring musicians and singers to show off their many talents. 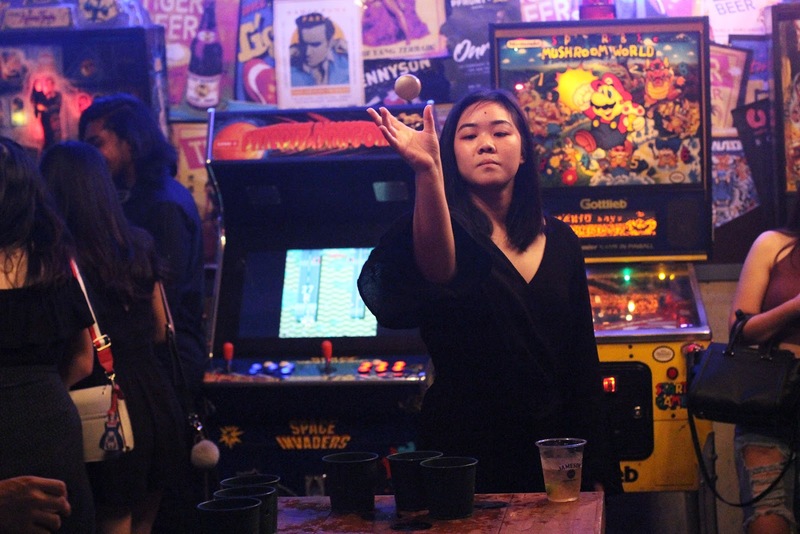 The event will feature a pop-up tattoo parlor by Shipwreck Tattoos, an interactive photo booth, a variety of crowd pleaser party games like Giant Jenga, Twister, and Whiskey Pong. All attendees will be presented with special gift bags sponsored by Forever 21, Kiehl's, and many more to further celebrate the night. While the event is more women-centric, men are highly encouraged to show their support in attendance. Interested attendees can sign up here, I just did so join me and let's get mortal in support of women empowerment! You may also check the event page on Facebook here! An 11/11 giveaway, courtesy of ezbuy.my! Any brands interested in collaborating, features, and/or sponsoring man, do hit me up at JonYKT@live.com! 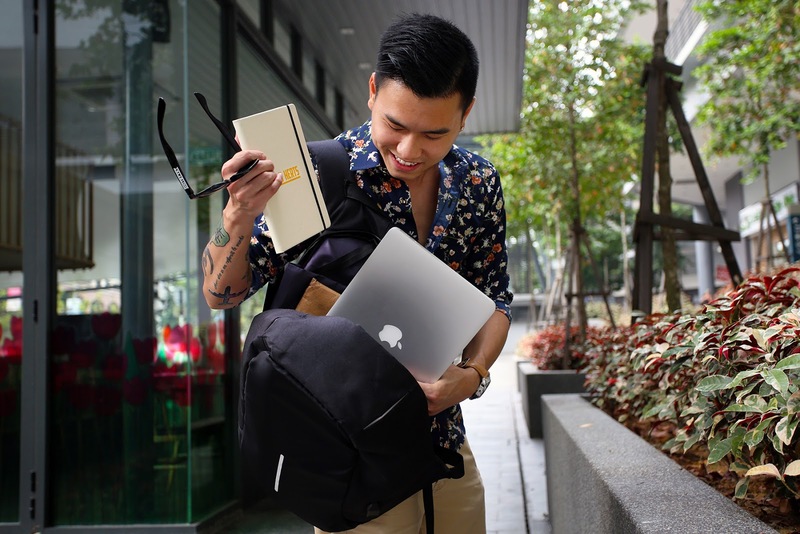 In conjunction with the comeback of man's website and Single's Day (11/11), famed as world's biggest online shopping day, Malaysian online shopping service ezbuy.my linked up recently with a collaboration opportunity, providing me with an anti-theft backpack and giving me an extra piece to conduct a giveaway for my fans on Facebook. I will be hosting the giveaway for my Malaysian fam from today until 11/11. To stand a chance in winning this anti-theft backpack, fans just have to follow three simple steps stated on my Facebook post here - easy ting!